Have you ever performed the perfect brow sculpt or lash lift and then you come to “taking a photo” to showcase your amazing skills, only to sit there swiping the screen a million times and scratching your head in disbelief as to why it doesn’t look as good as you see in real life? It is undeniable that the beauty industry is forever evolving, so is our marketing and social media platforms and the opportunities to attract new and potential clients through the art of a perfect image. Importantly you now have the technology and skills to do this for yourself! Having a strong social media presence and extensive portfolio of treatments are essential in attracting new interest and building client trust within your business. This makes it incredibly important to ensure that we are promoting quality images on all our media platforms. However, getting that “perfect” image is something that a lot of therapist’s struggle with. After all we went to beauty school, not photography school right? Well maybe some of you did, but for most of us we had to work it out the hard way. Here are some great tips for ensuring your images get that wow factor and boost your social media and marketing profile. Good Quality Camera/Phone – ensuring that you have a good quality phone or camera is step one to getting the perfect image. It really does make a huge difference, I see in classes all the time that the latest phones produce the best quality images. If your phone is old in technology and/or pixels are outdated, the images can come out blurry and a little distorted when using them for advertising your treatment or showcasing your amazing work! They also may not stand up against other people’s work who are using the latest technology. A pixelated image without that clarity does not give the client a true indication of your work. We want the photos to be clear, crisp and of high resolution. I use a Samsung S9 Plus and every time I take photos for students in a class they all go WOW! It has the best camera in my opinion, although iPhone X is great as well. Good Lighting – Good lighting is imperative. There are many different options on the market to help you with your photography skills in the way of lighting. Some of the tools that we find useful are selfie lights (USB chargeable light that attach to your mobile phone) These are fantastic for eyelash extensions and Lash Lift photos as you can get the ring around the pupil in the eye that really draws your viewer into the photo. Ring lights, traditional magnifying lamps, Glamcor lights, and great natural lighting are all very handy to have to brightening up the area you need to capture. Angles – Poor angle selection can make or break a photo. Choosing an angle that shows off both your work and the enhancement you have performed of the client’s natural features will ensure that perfect image. Take the time and get the angle correct. Photo Colouring – If you are talking before and after images, ensure that both photos taken have the same consistent colours and lighting. Sometimes the colours can be very different and this can give the impression that the photo isn’t even the same client in the after shot. You don’t want clients becoming sceptical about the results. Keep it consistent in the before and after image. Take lots of photos – You are not always going to get the perfect photo from just one. Try taking lots of photos of the same angle, different angles, as many angles as you can. This will ensure when it comes to picking the perfect photo you will have a lot of variety to choose from. Unleash your inner paparazzi! Haha, within reason of course. Touch up Apps – My favourite touch up app for images is Facetune, you can whiten the skin to get rid of redness, smooth out the skin for any imperfections and so much more! We also recommend Snapseed or Lightroom. You don’t need to go overboard with the effects but you can make a great difference to your image by giving it a little bit of sparkle and making the focus on the area you’re trying to capture. There is a plethora of apps out there now that allow touch ups to your photos that are really simple to use, definitely recommended if you want to add the WOW factor to your images. Using these little tips and tricks will really help to build a strong representation of your work and in this day and age Instagram and Facebook are huge for attracting new clients in the world of beauty. Importantly have fun with your photos and try to enjoy the excitement of capturing your amazing work and building your portfolio. The more you master it and share your work, the more you’ll reap the rewards. “This article has been written by Otto Mitter and produced for Ex-Import Niche Products. Modification, misuse, copying or reproduction of this content in any manner without written permission from Ex-Import Niche Products is prohibited and Copyright laws will apply. Sharing the link and giving credit to Ex-Import Niche Products for the content is allowed”. In the years gone by, the quality of lash extensions adhesive was not what it is today. The ingredients used, stabilizers and curing properties, as well as the flexibility of the product itself, have advanced dramatically and improved for the betterment for both the professional working with these adhesives and the client wearing eyelash extensions. 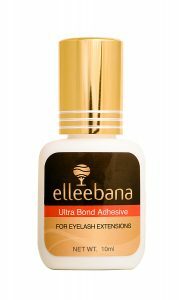 Elleebana lash extensions adhesive is produced in a high-quality environment that meets and exceeds all appropriate standards for production and is designed for use around the eye area. This product is vegan, not tested on animals, is formaldehyde-free and contains no latex. As these adhesives are cyanoacrylate-based products there is a short shelf life and even shorter after opening life as the adhesive begins to polymerize after exposure to air/moisture found in air – this is a standard expectation for all lash extensions adhesives (regardless of the brand) as the technology and raw materials used to manufacture these products are fairly similar. 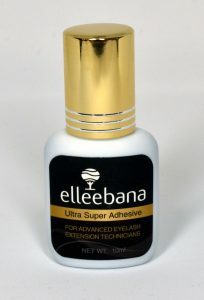 All types of adhesive in the Elleebana range are available in 5ml and 10ml sizes and have a variety of setting times that are suited to the technician’s requirements. 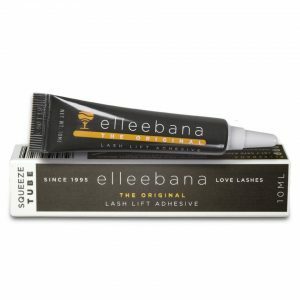 Elleebana lash extensions adhesives are thin – perhaps thinner that others available – this thin consistency aids to prevent overloading the lash line with unwanted or unnecessary quantities of adhesive. The quality of these adhesives is superior, due to the selection of exceptional raw materials chosen for the production, and only a small amount of product is required to do an excellent job. For classic lash extensions applications (a ratio of 1 eyelash extension attached to 1 natural lash or 1:1) a very, very small bead at the end of the lash extension is all that is required for ideal attachment. Most adhesives enjoy a specific room temperature and environment to be manageable and work to their optimum capabilities – this is the nature of an adhesive. Having a room that has too much humidity can see the adhesive curing before you have managed to attach the lash thus resulting in poor retention. Equally, if there is not enough humidity, your adhesive can become difficult to work with, setting too slowly, becoming stringy and creating what we refer to in the lash world as “stickies” – where your ratio of 1:1 changes and you have natural lashes adhered together. Elleebana adhesives enjoy the ideal humidity of 45 – 60% relative humidity and a room temperature of between 20 – 28 degrees Celsius. Shaking your adhesive for the minimum of 1 minute before use will prepare the consistency of the adhesive and allow ingredients to be perfectly dispensed without separation in each drop. The best way to shake your adhesive is to remove the lid of the product and insert the stopper/pin provided with each adhesive (you will find these in the adhesive bag) before shaking – this stops any adhesive from building up in the lid of your bottle. Always store the adhesive away from sunlight, moisture, heat and ensure the lid is sealed well between uses. Storing the adhesive in an air-tight container with a silica pack (also found inside each bag of adhesive) to draw out moisture is recommended. Do not store the adhesive in the fridge after opening – once the seal has been broken on the cap condensation can form on the bottle and the reintroduction of the adhesive to room temperature from the cool environment of a refrigerator, can result in moisture curing the adhesive inside the bottle. You can however, choose to store your adhesive in the fridge with a higher chill temperature than an average refrigerator (perhaps a small bar fridge is an ideal investment for the treatment room). If the fridge is allowed to stay at 17-21 degrees Celsius then the condensation will be less likely to form on the outside of the adhesive as the change in temperature from one environment to the next is not as dramatic. You can store the adhesive in a freezer before opening to prolong the shelf life but be sure to thaw out the bottle well before opening by letting the bottle sit in room temperature for a minimum of 4 hours. Each adhesive comes with a batch number – without this batch number the purchase of your product is void and no claim on the product can be made. Do not lose this batch number or remove from the bottle. You will also find the expiration date on the outside of the bag/box the product came in. A great tip for recording this information is to make a note of this on the invoice/correspondence from your supplier. Also writing the date you opened your adhesive on your bottle as a great reminder to re-order when you know your adhesive is getting old. All adhesives have an optimal usage time of 6 weeks and up to 3 months if stored and cared for well after opening. Only purchase and use our adhesives if you are professionally trained for the application or use of eyelash extensions. Under no circumstance should you attempt to use these adhesives to attach eyelash extensions on yourself or as a strip lash adhesive. Misuse of this product is not the responsibility of the brand in any way nor the reseller of the product. Getting the most out of your Elleebana adhesives is strongly determined by the room climate, storage, client and the way the technician uses the product. Understanding the products and how they are used determined by attending formal training is the recommended way to avoid misuse of the product. MSDS is available for you upon request. A patch test is required for new clients and for any changes of adhesives. You may also like re-patch test your clients again as their own medical and physical changes can occur and sensitivities can develop over time. Patch testing is recommended 24 – 48 hours before a client’s treatment and will require the patch testing of all products within the Elleebana range. Do not use Elleebana adhesives on any client that has sensitives to cyanoacrylate or black carbon pigments.